The semester is right around the corner! Classes start for us next week. I had an amazing and very busy summer with travel to 3 continents: Europe, Australia and South America. In addition, it was so great to see many great friends and people whom I truly admire at AEJMC in Washington , D.C. I cannot truly express the depth of the admiration I have for all of the people who’ve worked so hard to advance the field and who’ve truly made AEJMC PRD such an amazing educational opportunity. I left AEJMC inspired. I just wish I had more time to chat with everyone. I recently had the opportunity to write and have published 2 reviews for the Journal of Public Relations Education. Each review explored resources that I have discussed on this blog. So I thought I would share my reviews in case they are able to help readers get more information about either resource. 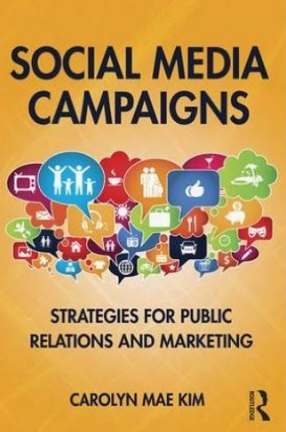 The first review was of Dr. Carolyn Mae Kim’s social media text: Social Media Campaigns: Strategies for Public Relations and Marketing. You can read the review below or see the review on the JPRE website. Here is a separate review I wrote of Kim’s book for this blog. The second review I wrote was of the Meltwater Social Intelligence Software. If you’d like to see more about what I’ve written about Meltwater on this blog, here are 2 posts I recommend. First, here’s how I used Meltwater last fall in my social media class. Second, this post discusses an assignment that uses Meltwater to pull down data. I want to thank the editors and staff of the Journal of Public Relations Education for the opportunity to write these reviews and for all of the hard work that went into editing and publishing them. It is an honor for me to have these two reviews published in the journal. I hope everyone’s semester is off to a great start. I hope you are feeling energized for the academic year ahead. This past summer, I took a bit of a (much-needed) break. I’m energized to be back and look forward to learning from everyone this year! Previous PostWatch my Internet Day 2018 keynote at the University of Aveiro PortugalNext PostWhat’s Changing? Hubspot Social Media Certification, Persuasion Class and More!